For Chau Smith, running clears her head to make better decisions. Getting older means learning to appreciate at this stage of life and treating it as a new adventure. There is still so much to be discovered. We keep hearing stories about people who have lived long and distinguished lives. All get older and occupy the trenches of the aged alongside millions of other people. It’s natural to dwell on the obituaries, appreciations and “whatever happened to” stories. Between these pillars of old and young, people around us are passing personal milestones all the time. Most go unnoticed, some gain broader audiences either through celebrity or grace and wit. Chau Smith was born in 1947 but her mother didn’t report her birth for three years as she went into hiding in Vietnam during the Indochina War. 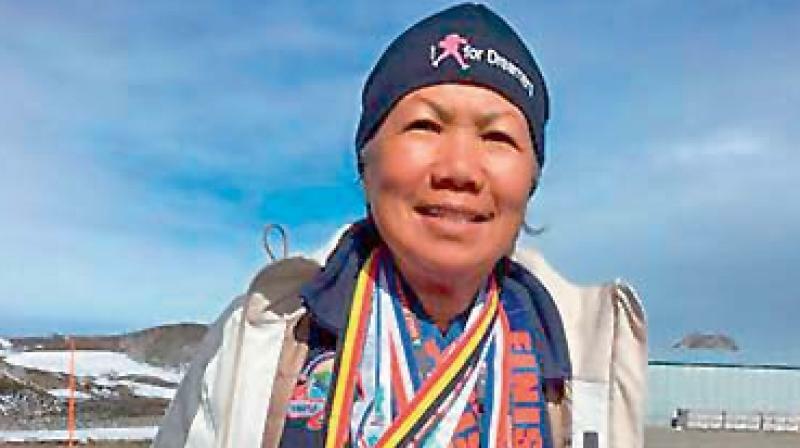 When Chau Smith turned 70, she wanted to celebrate in a special way — run seven marathons on seven continents in seven days. Wow! Does turning 70 mean that it’s time to give up on living? Does it mean losing interest in the things that have earlier been the source of passion and aliveness? Does it mean that we’re swept into the corner, left to gather dust until we finally fade away? What the heck is this ageing business all about anyway? Chau Smith ran in Perth (Australia), Singapore (Asia), Cairo (Africa), Amsterdam (Europe), New York (North America), Chile (South America) and King George Island (Antarctica). She would wake up, run the marathon and take the immediately available flight to the next location. When you are 70, you have a long experience of life, not only of your own but that of the others. One has seen triumphs and tragedies, booms and busts, revolutions and wars, great achievements and deep ambiguities, too. One has seen grand theories rise, only to be toppled by stubborn facts. They can take a long view and have a vivid perspective. Chau Smith owns a dry-cleaning business. “I live a stressful life. I work 10 hours a day. Running makes me feel good. I can’t really put it into words. Even when I’m really in pain, I’m able to think about something else positive,” she says. The reality of ageing for many people is very different. When you turn 70, you can’t consider yourself middle-aged any more. Let’s face it, you’re wicked old. Is it too far-fetched to think that 70 is the new 50? Or maybe the 40th anniversary of the 30th birthday? In the end, celebrating life should be something we should do each day. It doesn’t need to be based on monumental accomplishments. Think you’re too old to get into running, let alone running? Think about how you define yourself today. Who are you? Getting older means learning to appreciate at this stage of life and treating it as a new adventure. There is still so much to be discovered! This time of life offers a whole new possibility for learning and engaging in newer things. Blow out the candles, work, play, nap, read all the books you never got to read, play with your grandchildren, walk your dog, travel, be with your friends, run marathons, complain about your ageing face and body, believe you look 10 years younger than your age. Just keep jumping those hurdles.